Productions of the old D'Oyly Carte were filmed on only three occasions. The first, a 1965 television production of Patience, unfortunately does not survive. The third, a 1973 video of Pinafore, caught the Company well after its sad decline had begun. The second — this Mikado, dating from 1966 — captured the Company just before performance values started seriously to erode. One cynic observed that this was the last great Mikado cast D'Oyly Carte assembled, an assessment it's hard to disagree with. Unlike the 1965 Patience and 1973 Pinafore, this production was shot on film and actually enjoyed a brief theatrical release. However, G&S was simply not a mass-market prospect, even in 1966, and the film soon closed. The production has frequently been shown on television and is available on home video. That so little of the D'Oyly Carte output was preserved on film is both sad and curious — sad, in that their unique stagings are now lost forever, except in people's memories; and curious, in that it might have seemed an ideal way for the Company to increase its visibility, particularly among younger audiences. However, throughout most of the 1960s and 1970s, D'Oyly Carte management stubbornly believed that exporting their product to the television market would only diminish the market for their stage performances. By the 1980s, attitudes within the Company began to change, and when a video producer named George Walker suggested that the Company's productions be captured on tape, D'Oyly Carte management agreed. Unfortunately, Walker subsequently decided that the Carte name was no longer marketable, and he went ahead with his own independent production team. The result was a set of largely mediocre video performances (the Brent Walker videos), while of D'Oyly Carte this 1966 Mikado is essentially all that we have. Having waxed nostalgic about lost history, I am forced to admit that this production admits of only modified rapture. 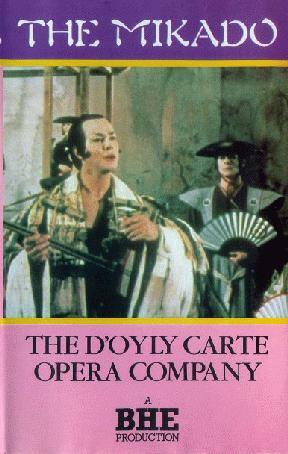 It is a faithful representation of the D'Oyly Carte Mikado, but the performance is extremely flat. One senses that the cast, lacking a live audience to interact with, are merely going through the motions. I've never been able to watch this video straight through without struggling to stay awake. My feelings towards this film are quite different. I think the 'flatness' that comes across is not from the performances but from the lacklustre style of filming, which makes the whole thing appear to be flat, but is not. I watched this (again) only last night and was once again delighted by it. The cast is first rate, and the performances are superb. Ignoring the sets, etc., I really do think this is to be considered the best Mikado we have on video, or for that matter the best we are likely to see. I think it would be very hard to surpass the performances of John Reed, Peggy Ann Jones, and Donald Adams in particular. Philip Potter has less individual personality in the role of Nanki-Poo, but he is just so nice, perhaps a little too nice (butter wouldn't melt…, etc.). I do admire Green's performance of Ko-Ko [in the 1939 film —ed.] and there are some bits of business that would have added even more to Reed's performance if they had been included, but overall I much prefer Reed. I do think however that Sydney Granville comes over much better than Kenneth Sandford as Pooh-Bah. The two Katishas are fairly equal I think, although the earlier player really does look an old battleaxe. I just read your comments on this film and could not agree more. In fact, it was a snore in the theater back then, and I forgot how boring it was until I bought a video to show my kids how "great" G&S could be. Silly me. They made it through about 40 minutes before politely bowing out. The irony is that the DOC was still in excellent form in the late 60's. The film is a foreshadowing of the decline of the company, and, with all the close-ups, points up how "precious" Reed could be. This tendency unfortunately seemed to increase as time went on. 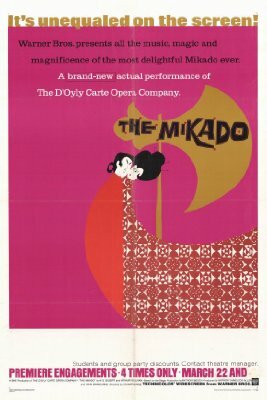 The 1966 Mikado was released in the US by Warner Brothers, which also released Hamlet, Othello, and La Bohème around that same time (1964-1966). These were all essentially filmed stage performances (La Bohème was originally filmed for European television), and WB seemed to be promoting them as an unofficial "series" of live performances of classics captured on film. There are apparently multiple cuts of this film. Ralph MacPhail says that he saw two different versions, one of which omitted "Braid the raven hair," the other "Alone and yet alive." Both omitted the second verse of the Madrigal. Phil Sternenberg says he saw a broadcast on PBS in 1976 which omitted all of the above, plus "Comes a train of little ladies." Another broadcast, on the Bravo network in 1981, was complete except for the "song of the sea" section of "A wandering minstrel." The "Knightsbridge" line is missing in all versions, and Ko-Ko exits after "Don't laugh at him, he can't help it." The "Knightsbridge" line was no doubt omitted because the film was meant to be shown worldwide, and no substitute location would have been considered funny by all audiences. Correspondent Harun Rathore says that the exit after "Don't laugh at him…" was standard D'Oyly Carte practice at the time, although no other source corroborates this. Rathore also observes that, prior to the second verse of the Madrigal, the characters get into position as if they're going to sing it, but then "all of a sudden Ko-Ko appears and Go-To and Pitti-Sing leave in different directions." This suggests the second verse was filmed, then edited out. I saw [this film] when it debuted, and it was in the wide-screen format. I agree with the majority, that it seemed as though the performers were going through the motions rather than being the characters. My primary gripe as I sat watching the wide-screen version is that the camera frequently missed bits of significant business the eye is automatically drawn to in the theatre; that is to say, the camera would be in long-shot rather than close enough to capture significant bits —and by the same token, too close to catch 'em. The camera set-ups and editing is just plain sloppy. Because it is a D'Oyly Carte production, I would still love to have a video copy; but neither the VHS or DVD, alas, presents the image in the correct ratio. The cropping of the original image is so inept, the composition is frequently offset.